Although yurts have been around for centuries, they’ve only recently gained popularity as a camping alternative. Historically used by nomads on the steppes of Mongolia and Siberia, these round tents with wooden frames are popping up at campgrounds and state parks across America. The modern versions, which include creature comforts such as electricity, wood floors and even propane heaters, are a great way to enjoy the great outdoors without pitching a tent. So pack the car and head to Colorado to enjoy these wheelchair-accessible yurts. Operated by the YMCA of the Rockies, Snow Mountain Ranch (970-887-2152, www.ymcarockies.org) is located 80 miles west of Denver, in Granby, Colorado. The 5,000-acre ranch offers a number of lodging choices, including campsites, cabins, lodge rooms and yurts. The yurt village is located a short drive from the main lodge, and there’s plenty of room between the yurts for maximum privacy. There is accessible parking in front of the accessible Red Fox yurt, which features ramp access to the front door. Access features include a wide door, wood floor and plenty of room to navigate in a wheelchair. It’s furnished with a 23-inch high open-framed queen-sized bed, two sets of bunk beds, a table and chairs, a microwave and a refrigerator. And if you’d prefer to cook out under the stars, there’s an accessible grill and a picnic table on a cement pad just outside the door. There is an accessible shower room in the nearby shower house. It features a toilet with grab bars on the back and right walls (as seated), and a low-step shower with a hand-held showerhead and a fold-down shower bench. There’s plenty of room to roll around in the private bathroom, which also has a locking door. Outside there’s a large sink to rinse off your dishes, and a emergency phone connected directly to the office. All in all the access is pretty good, and at just $89 a night, it’s also a very affordable lodging choice. 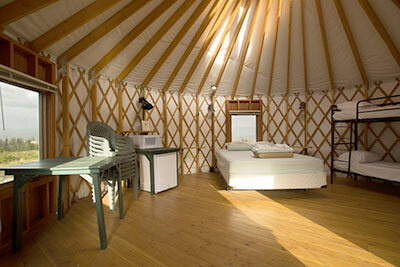 Even better, bedding and towels are included, which isn’t necessarily the case at all yurts. The property also has a nice indoor pool with accessible parking in front, and a level walkway to the building. 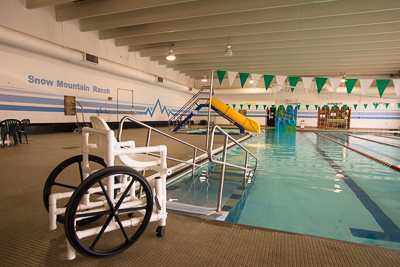 The pool was accessible long before there were any regulations on the books, and it has a cement ramp and a water wheelchair. Just transfer to the water wheelchair and roll on in. The locker rooms are also accessible, with accessible toilet stalls and roll-in showers. 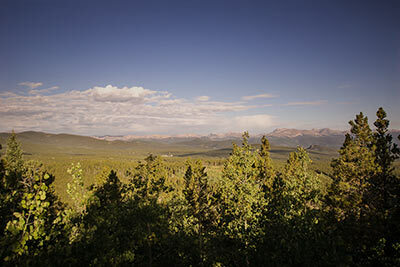 If you’d like to stretch your legs a bit, head over to nearby Rocky Mountain National Park. The mile-long Coyote Valley Trail, which is located four miles from the west entrance, is a good accessible choice. This hard-packed dirt trail follows the bank of the Colorado River and affords great views of the Never Summer Mountains. On the other side of the park, the .9-mile Lilly Lake Loop affords equally stunning views of waterfowl, wildflowers and of course the lake. The level trail is covered with crushed granite, and features strategically placed benches. And don’t miss the drive across the 12,183-foot summit on Trail Ridge Road. Even if you don’t get out of the car, you’ll still get some great windshield views. 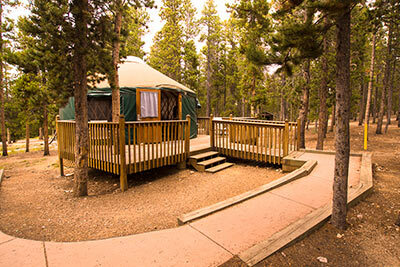 Another accessible yurt is located in Golden Gate Canyon State Park, 30 miles northwest of Denver. Just turn on Gap Road from Highway 119 and follow the signs to Reverend’s Ridge Campground (303-470-1144, www.parks.state.co.us). 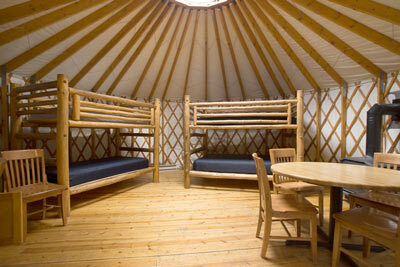 Yurt 1 – also known as Bobcat – features private parking next to the yurt, with ramp access up to the roomy front porch. There’s good access inside too, with plenty of room to maneuver a wheelchair. It’s furnished with a 23-inch high double bed, a twin bed, a pair of bunk beds, and a table and chairs. There are lights, electrical outlets and a propane heater in the yurt, but all cooking must be done at the fire ring outside. There’s also an accessible picnic table near the fire ring. An accessible restroom is just a short level walk away, but the showers are located on the other side of the campground. It’s best to drive to the showers, as there’s not a good accessible path to them. There is a roll-in shower with a fold-down shower bench in both the men’s and women’s shower houses. The showers are coin-operated, and the accessible ones can be easily used from a seated position. It’s costs about $2 for a good shower. There are also accessible toilet stalls with room to maneuver a wheelchair, in both shower houses. Although this yurt lacks a refrigerator and a microwave, it’s still pretty comfortable; and the front porch is a very pleasant addition. Bedding and towels are not provided. The nightly rate is $70, with a $10 reservation fee. Make sure and take the short drive up Gap Road to Panorama Point while you’re in the area, as it’s aptly named. There is accessible parking, with level access to picnic tables, and a nice boardwalk out to the overlook. It’s the ideal place to enjoy the sunset. If you’d like a short nature walk, then go south on Mountain Base Road, turn left on Highway 46, and head to the Visitors Center. There’s accessible parking outside, with barrier-free access to the building, and good access around the interpretive exhibits inside. Outside, the quarter-mile Show Pond Trail features paved access around the trout-filled pond. Pack a picnic lunch and enjoy it on an accessible picnic table on the back patio. 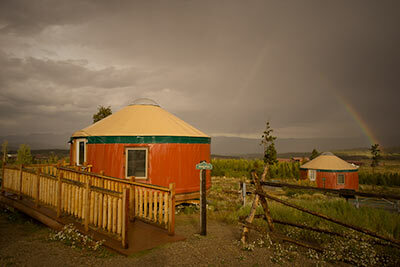 There’s a great view of the pond, and it’s the perfect way to top off any yurt visit.